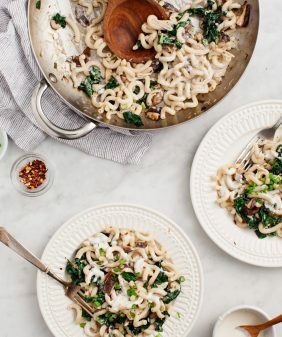 Making this flavorful mushroom pasta is a breeze - sauté mushrooms with a splash of wine, and toss with pasta, garlic, herbs & a little cashew cream. It seems like every day these days is some new National ___ Day… National Dog Day, National Donut Day. But today is extra special, because today is not just a National day, but a World day, and possibly one of the best food World days, as it is World Pasta Day! So, obviously, to celebrate, I made pasta! 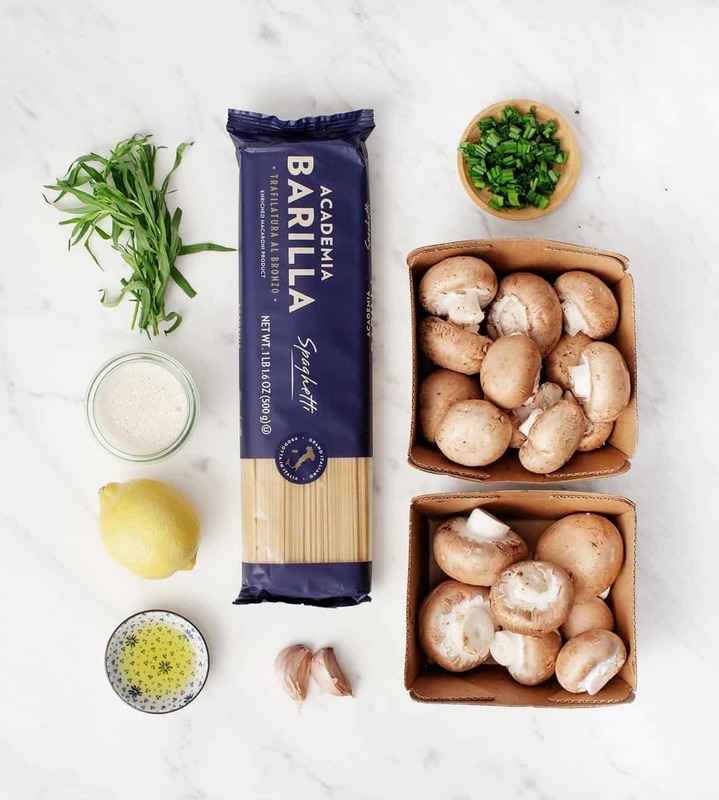 This mushroom pasta was inspired by our recent trip to Parma, Italy. Mushrooms were in season in the area, and every restaurant we went to seemed to have a mushroom special. Mushroom ravioli, mushroom spaghetti, mushroom soup, mushroom everything. Jack and I happen to love mushrooms, so I was itching to make this mushroom-lovers spaghetti once we got home. This recipe, obviously, starts with the mushrooms. I used sliced cremini mushrooms, but by all means, mix in other varieties such as chanterelle mushrooms or oyster mushrooms if you want to get crazy. The rest of these ingredients – olive oil, garlic, herbs, and a touch of cashew cream with Dijon mustard – seem so simple, but they compliment the mushrooms in such a delicious way. Specifically, if you’ve never tried tarragon before, it has an anise/licorice flavor that you might not love at first sniff, but it REALLY makes the deep savory flavor of the mushrooms pop. 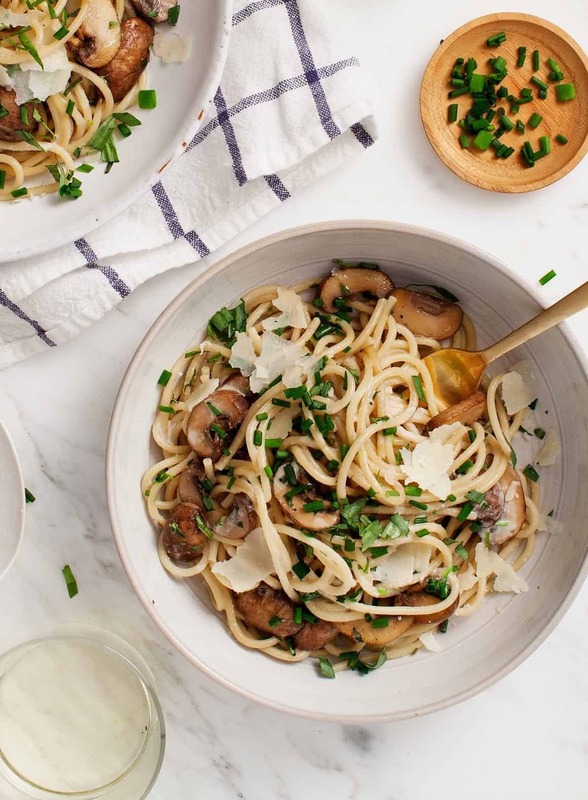 Now that the weather is cooling off, this mushroom pasta is our kind of weeknight recipe. 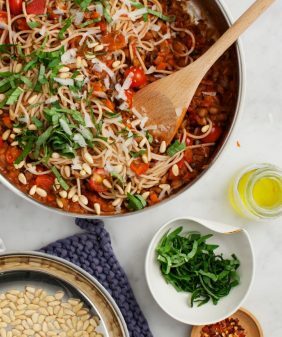 It’s quick to toss together, which is the beauty of pasta, but it’s also yummy, satisfying, and very flexible. For example, if you don’t have tarragon and chives, rosemary and/or sage would be delicious… sub in gluten-free pasta if you want to, and there’s a vegan option (below) to use cashew cream instead of regular cream. Of course if you’re not vegan, top this with fresh Parmigiano-Reggiano, because this recipe is inspired by Parma after all! Serves: 2 large servings or 3-4 smaller servings. Make the cashew cream by blending all ingredients in a high speed blender until smooth. Set aside. (note: it’s not going to be very thick, it should be the consistency of half & half or heavy cream). In a large pan heat the olive oil oil over medium heat. Add the mushrooms, a few generous pinches of salt and pepper, and cook until soft and wilted, stirring occasionally, about 8 to 12 minutes. Meanwhile, cook the pasta in salted boiling water 1 minute short of the package directions, until al dente. Reserve ⅓ cup of the starchy pasta water before draining. To the mushrooms, add the wine. Stir and let it reduce for 1 to 2 minutes. Stir in the garlic, then the cooked pasta and toss. Add a few splashes of the cashew cream and a few splashes of the pasta water and toss to create a light sauce. Add half of the fresh herbs and season to taste. Serve immediately with remaining fresh herbs and Parmigiano Reggiano cheese on top. To make this vegan, skip the cheese and and serve with a few drizzles of balsamic vinegar. Change up the herbs: rosemary and/or sage would be delicious here, but add those heartier herbs to the pan as you add the mushrooms so that they'll cook more than the softer herbs. This sounds absolutely delicious! I have to say that I am delighted to see Italian cooking that does not include tomatoes. This pasta is what dreams are made of! Especially on this rainy day here in Boston! This looks so beautiful! the mushrooms are drool worthy!! I’m loving ALL the pasta dishes coming out today. I’m a big fan of mushrooms, so this is definitely happening! One of the best national/world food holidays out there! I will definitely be making this recipe for my husband and I soon. Thanks for sharing! I know what I want for dinner! 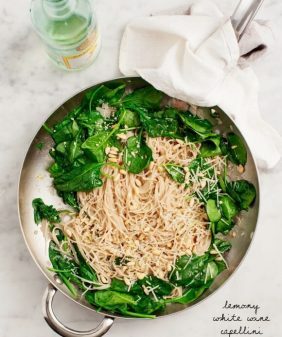 Thank goodness for pasta because dishes like this make me soooo hungry!! So simple – and so delicious looking! I am definitely keeping this one for future reference. This looks like a keeper…I will try it this weekend! 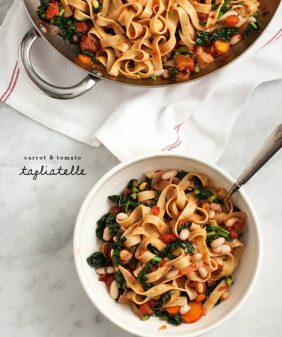 This looks like a great weeknight meal! 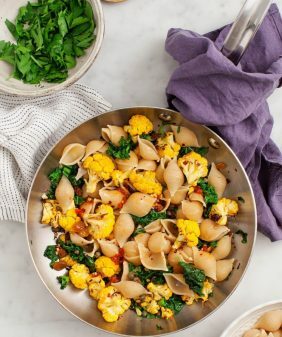 I love mushrooms and pasta, and have never tried mustard with pasta–will have to give this a try, the sauce sounds delicious! It’s barely a hint of mustard, you don’t really taste it, it just adds a bit of tang! I hope you like the pasta! Wow! This was amazing. My daughter and I have moved this recipe to the top of our “MUST make again list!” I couldn’t find fresh tarragon at the store, so I used dried. Next time, with fresh tarragon, it will be even better. Thanks for sharing this recipe! Hi Jeni – I’m so glad to hear how much you and your daughter loved it! I’m happy to hear that it worked with dried tarragon – let me know how you like it next time with fresh! This looks delicious, I love Italy and I love mushrooms so I know this is going to be a winner. 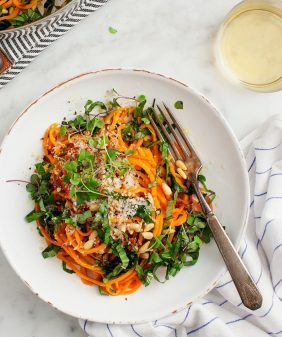 I will be using gluten free pasta so hopefully it tastes just as yummy as it looks here! Thanks for the recipe! I love pasta and mushroom. A lot of recipes to cook but this one’s a must try I guess. Will surely cook this one soon. This was so delicious! I’m not a fan of creamy pastas, but the cashew cream added great depth. I made this as written and wouldn’t change a thing. Will make this over and over again. I’d like to make this for company, without the wine. Could you recommend a vegetable broth or other substitute? Hi Kathy – broth would work instead! Maybe finish with a small squeeze of lemon to replace the bit of zing that wine gives it. I was wondering if you need to soak the cashews overnight (or for a couple hours) before making the cream? Fantastic blog, by the way, your content is inspiring. Hi Jen! I don’t soak mine, but I have a vitamix that blends up anything. If you feel like your blender won’t get them creamy enough, you could soak them for a few hours. Thanks so much! I will try soaking for a few hours. Hi Jeanine, I was skeptical about the tarragon since the only way I’ve ever known it to be used was when growing up my mother added it to our winter stored bottled vinegar. I’m curious by nature and your website and cookbook have contributed a lot to go vegetarian. This dish was a hit[one more ..] tonight. Prepped with Creminis and Chanterelles. Miam ! ps: the cashew cream was just the perfect. Made this a couple of nights ago, and it was outstanding! I subbed rosemary for the tarragon (not a big fan), as you suggested. My carnivore boyfriend wolfed it down, and we had a bit of a ‘debate’ over who would get to take the leftovers for lunch the next day. I won on the condition that I make this again in the very near future! Ha ha, I’m glad you both loved it so much. Love the rosemary idea! This was AMAZING. I didn’t have all of the ingredients on and, so I had to make do with what I did have, and it was still incredibly tasty. I will be making this again in the future for sure. Thanks for a great recipe!